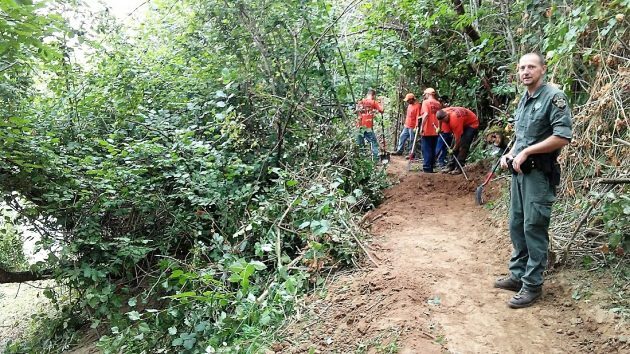 Supervised by Deputy Michael Kadin, the Marion County sheriff’s work crew cuts a trail to the Luckiamute River on Thursday. After years of planning, the beginnings of a better paddlers’ access at the Luckiamute State Natural Area were taking shape on Thursday. But a more permanent setup will take a little longer. The state parks department originally had planned for a launch ramp and dock to give paddlers easy access to the river. But that plan proved unfeasible. Kevin Strandberg, manager of the Luckiamute area and several other state parks, told me in February the ramp idea at the originally planned site had been dropped. Instead, he planned to cut a trail to a cove about 150 feet upstream, where the natural terrain makes launching small boats easier, and no ramp or other structures would be needed. I wondered how that was coming and checked in with Strandberg this week. He still thought the cove was the best place for river access, but the trail there would run across land owned by the Oregon Department of Fish and Wildlife. He planned to talk with the ODFW manager at the E.E. Wilson Wildlife Area to see about allowing that trail to be built. In the meantime, he settled on an interim solution. By this weekend, he hoped to have a different trail cleared, closer to the riverbank, leading to a kind of chute where boaters can slide their craft down to a small beach and launch from there. The temporary trail is likely to be washed out by high water next winter. It twists and goes up and down, and transporting a long canoe will take two carriers. Strandberg says that the other trail he has in mind, if approved by ODFW, will provide much easier access. It would be straight and flat, and boaters could use hand carts to transport their craft.